Current selected tag: 'iTunes U'. Clear. Robin Good: I may be completely off the bat, but the new iTunes U Course Manager looks like a great new opportunity for teachers, professors and educators of all kind, to curate online courses that bring together the best learning materials available on a topic, and which can be accessed by anyone iOS, Mac or PC with iTunes installed. Given the above, any teacher using this new iTunes U authoring platform can effectively "curate" an online course that contains the very best resources and materials that one has been able to identify and bring together. From TheNextWeb: "Apple’s iTunes U now lets teachers create their own courses for iPad, the company revealed on its site. In practical terms, this means that students and pupils will be able to access this content on their tablet via the iTunes U app. 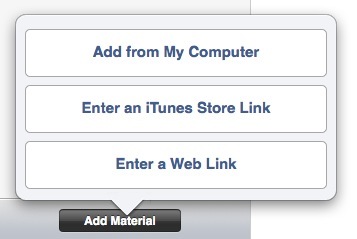 Teachers interested in using this feature need to register on iTunes U’s Course Manager page via Safari. While the functionality is available for free, teachers not affiliated with schools that have public iTunes U sites will be limited to 12 courses and 50 students per course, Apple says." in iTunes U you can choose under which type of license you want to release your course: both All Rights Reserved and six flavors of Creative Commons licenses are available. "iTunes U is a free service hosted by Apple that allows instructors, administrators, and affiliates to manage, distribute, and control access to educational audio and video content for students within a college or university."